Cosy is not the word that would normally spring to mind when discussing a prehistoric mound — especially one that contained ancient human remains . . . and some (regrettably) newer ones. But the Neolithic burial site known as Newgrange in the midst of the bucolic Irish countryside feels safe . . . comforting even. Set on a grassy hilltop near a bend in the River Boyne, the oval-shaped structure softly rises above the rolling farmland dotted with sheep, cows and yellow fields of canola. Access to the site is controlled by the Brú na Bóinne Visitor Centre and the cost of a vistor’s pass starts at €2. As the Irish will proudly tell you, this structure is older than the Great Pyramids and Stonehenge. First discovered in 1699, it took more than 250 years before it was properly excavated and much remains a mystery. Not nearly as famous as those ancient marvels, the site is best known for the precision of its builders in aligning a gently bending 19-metre passageway with the rising of the sun on the Winter Solstice, bringing light deep inside to the dead before the longest night of the year begins each December. The passageway the sun travels is narrow by today’s standards but rather than creating a claustrophobic effect, you feel hugged by the giant ancient stone slabs as you edge towards the burial chamber. At the end, the passageway opens up to reveal a corbelled (or vaulted) roof that will take your breath away. This structure, as our guide tells us, remains watertight to this day — an estimated 5,000 years after it was built. An amazing engineering feat by the builders of this site who had no mortar to bind the stones together. Off this main chamber, where several people from our tour group easily stand together, are three smaller chambers where ancient remains were placed. Before entering the mound, our guide had given us the standard ground rules when visiting historical sites with an odd addition: DO NOT leave the ashes of your Uncle Ted or Grandma Lucas behind. (Seriously, who does these things? It’s an archaeological site for gawd’s sake!) Although there are no visible bones or cremated remains, modern ashes destroy the integrity of the site. We’re also told archaeologists are not in agreement on what Newgrange was built for, or even what it housed. It’s possible, our guide suggests, that the site was once filled with gold like other hoards found in Ireland. Being Ireland, folk tales also suggest burial mounds like Newgrange may be the home of faeries. Everyone who visits the site also has the opportunity to enter the annual lottery for the 100 spots available to be inside for the Winter Solstice lighting. 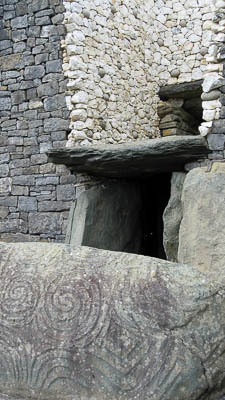 The ancient light effect is achieved by a “roof box” — really just an opening in the stone — above the doorway to the tomb. For those of us not lucky to be there for the solstice, our guide recreated the experience using an electrical box. It’s incredible seeing the light travel down the passageway until it comes to the burial chamber resting on the basin stones where the remains of the dead were placed. All is silent as we watch the light travel towards us in the dark. Walking back into the sunlight makes the white quartz stones fronting the mound even more dazzling as your eyes adjust to being back in this world again. The exterior of Newgrange, which stretches 76 metres across and 12 metres high, was “reassembled” in the mid-20th century with these stones found scattered about the site. It’s a reconstruction that remains controversial to this day. One thing time doesn’t seem to have touched is the mammoth stone that guards the entrance, deeply etched in a repeating tri-spiral pattern. 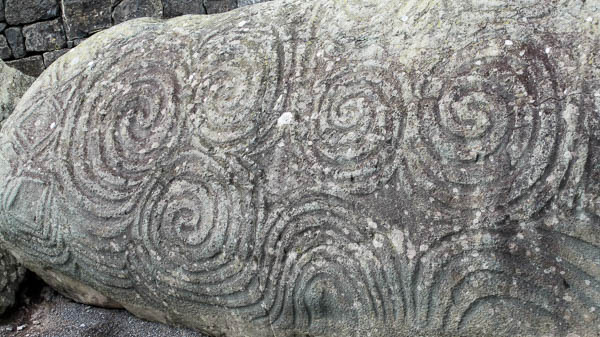 The design, which is instantly recognizable to anyone who has ever tried on any “Celtic” inspired jewelry, is repeated on stones located along the perimeter of the structure, as well as inside the mound. In fact, I highly recommend a walk around the mound. Not only is it stunning but the landscape surrounding it is beautiful. Like so many ancient sites in Ireland, life continues around it. 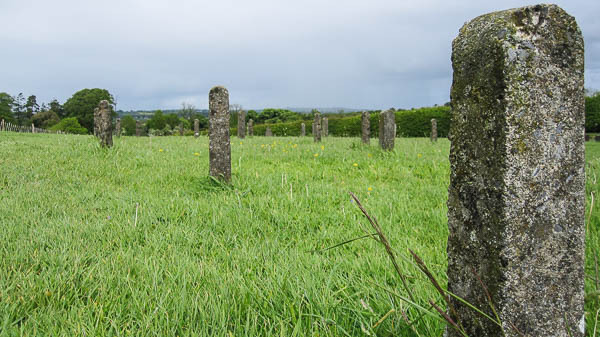 Sheep gambol on the Hill of Tara, cows munch on grass just steps away from the priceless high crosses at Monasterboice, and the recently deceased are buried next to ancient forefathers in graveyards across the emerald isle. The past feels very present as a result. Newgrange also hasn’t been ruined by the hordes of tourists who flock to better known sites in Ireland and elsewhere in Europe. Although you don’t dawdle in the mound, the tour doesn’t feel rushed. You actually get to truly experience the site. The air is clean, there are no screaming children and no souvenir hawkers. The ancient dead can actually get some peace. Newgrange is a great day trip from Dublin. For those who want to sit back and enjoy the scenery (and have limited time), I’d highly recommend taking the Newgrange & Hill of Tara tour offered by Mary Gibbons Tours. The cost is €35 and includes all entrance fees and hotel pickup. It’s a small group and she is hands down the best tour guide I had my entire time living in Ireland. If you drive to Newgrange, there is also the possibility of visiting Newgrange’s sister mound called Knowth. I was there twenty years ago, so so lovely. Great post. Thank you! It is an amazing spot. Very nice post 🙂 Ireland looks nice. My blog is http://smilebac.com My mission is making you smile. Have a look!